The Panamanian side of a Colombian-Panamanian border outpost at Alto Limon. Photo by SENAFRONT. On the morning of March 31 a National Frontier Service (SENAFRONT) outpost on the Colombian border was fired upon with rifles, mortars and grenades from the Colombian side. 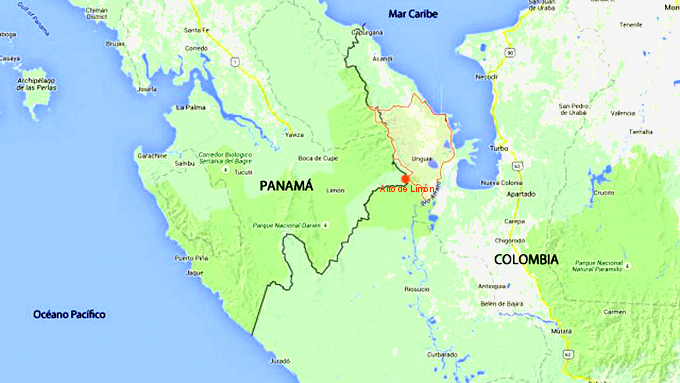 The Panamanian border forces returned the fire with rifles and nearby Colombian forces pursued the attackers. The clash lasted about 15 minutes and on the Panamanian side at least nobody was hurt. The incident took place at Alto Limon, a spot of the border where both Panama and Colombia station guards on their respective sides. It was part of a day of violence accompanying an “armed strike” by Colombia’s Clan Usuga, an offshoot of the right-wing paramilitary movement that has long had a presence in the area. Literature calling for the strike cited political and economic complaints against the Colombian government in Bogota, but the official narrative of both the Panamanian and Colombian governments is that the Clan Usuga is merely a criminal gang without political motives. The Clan Usuga, which emerged out of the earlier Urabeños and before that the AUC and ACCU paramilitaries, does engage in drug trafficking, illegal gold mining and illegal logging, mostly on the Colombian side of the border but also in Panama. Panamanian police have shot it out with them on the Costa Arriba of Colon and rounded up some of their smugglers and money laundering operatives in the Panama City metro area. The politics of the organization aren’t so much about ideology as about rural warlords carving out turf on the Colombian periphery, a chronic problem for the Bogota government ever since Colombia’s independence from Spain. This challenge to central authority comes as Colombia’s Santos administration is moving to conclude peace talks with one leftist manifestation of rural wardlordism, the FARC guerrillas, and beginning talks with another leftist rebel band, the ELN guerrillas. The armed strike shut down transportation, businesses and public services in several parts of eastern Colombia. Two police officers were killed. On the Panamanian side President Varela sent two National Aeronaval Service (SENAN) to the border area to strengthen defenses there. Where the incident took place.